Southwest Las Vegas remains a highly desirable area of the city to many residence since the I-215 Beltway was completed. This gateway essentially made the entire greater Las Vegas area easily accessible to the Southwest. Many residence that commute to the Las Vegas Strip love the convenience to get there quickly. The southwest offers newer construction in many areas and majority of the real estate in the area is very affordable. Over the last several years major home builders have continued to develop the area with some amazing master-planned communities. Each community has its distinct differences such as being a guard-gated golf course community or a community that retains the natural landscape of the area as it builds. In addition there is a also a section with custom homes on half acre or larger lots. 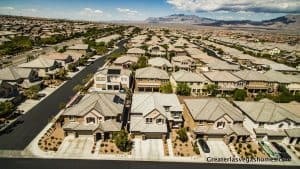 If you are looking for newer constructed homes, then Southwest Las Vegas is a great place to consider as it it one the newer areas in the city with such convenience to everything Las Vegas has to offer. Prices for single family homes start in the $230,000 range.